Discover the perfect Florida Keys vacation rental home or condo for your family, friends, or large group. 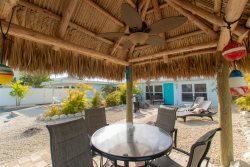 Island Breeze Realty offers premier vacation rentals in Marathon and Key Colony Beach, Florida featuring private docks, pools, and gulf views. Our Coral Lagoon Resort Villa offers nightly rentals, if you are interested in a weekend stay in paradise this is the ideal rental! Beautiful Florida Keys vacation homes and condos that are available to rent for a one week minimum stay or more. Our Fabulous Flamingo Vacation Home offer 2-week minimum rentals in Paradise. Bring your dog along! Weight limits, breed exclusions, and pet fees are property specific. Please ask our Property Manager for details. Extend your stay in Paradise. We have gorgeous 28-day minimum Vacation Homes that are also available to rent. You can even stay longer, as long as your stay is less than 6 months. April is a great time to travel after the Spring break rush is over. Take advantage of lower rates, especially in the Florida Keys where summer never ends, the drinks are salty and the palm trees are flowing with the Island Breeze! Enjoy 15% off of your stay with this special. Valid on April 2019 stay dates. Valid for Select properties. Applies to new reservations only.